From January 2011 to January 2012, I held the Art Director position on the BlackBerry account with a talented team of designers, user experience specialists, and cutting edge developers. Over the course of the relationship we pushed several new digital experiences to assist BlackBerry's CMO in transforming the brand in order to play a more competitive role in a challenging hardware market. With key learnings around responsive site design a few years away, the blackberry.com experience needed to perform all the functions of the desktop version in landscape and portrait modes for fluctuating screen sizes. 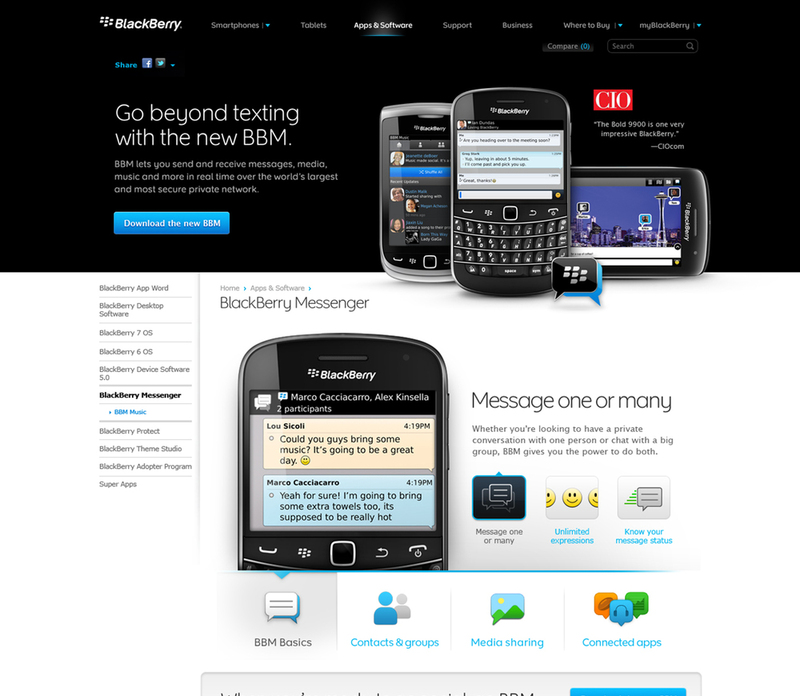 In 2012 BlackBerry went live with our designs and the tablet site design process help define the boundaries of responsive design and UX at Razorfish Austin and began a new dynamic between creative and development that would be essential as flexible layouts became a mandatory in the industry. Sometimes getting noticed takes star power, enter Katy Perry. Digital device makers began hiring celebrity CMO's to show street cred and build brand hype so we created a 'day in the life' style celeb web experience. With Katy Perry at the helm of a product launch, BB10 had all the sparkle without the internal politics. Everyone likes to use tactile buttons on there electronics right? This line of questioning was beginning to show stress fractures as BlackBerry joined the touch friendly tablet family with its very own PlayBook. With a smooth design, BBM, and a powerful processor, the PlayBook was poised to make waves and we designed an interactive experience to show everyone how/why to use it. BlackBerry enlisted comedians Streeter and Amir to help debunk some myths and rumors circulating online about the brand. The result was a new visual style to help elevate the brand among a key demographic of influencers.